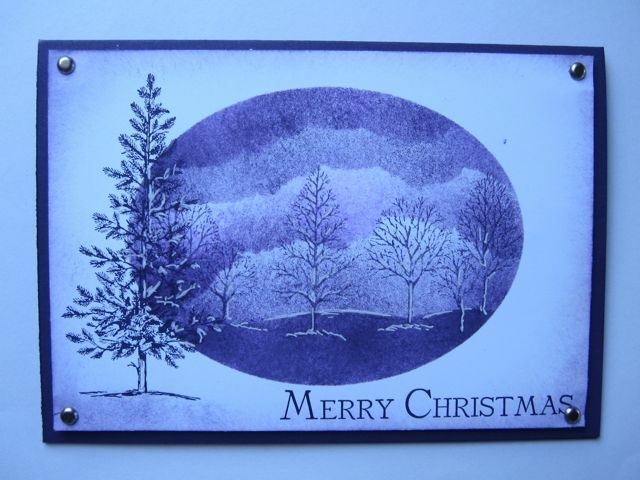 Create Beautiful Christmas Cards Using The "Lovely As A Tree" Stamp Set From Stampin Up. Christmas cards are so much fun to make and it's always interesting to try different stamping techniques to achieve a variety of results. I really enjoy the techniques of masking and sponging and am constantly looking for ideas on how to use them. Recently I saw a beautiful card on the blog of my stamping friend and fellow demonstrator, Vanessa Webb, and was so inspired I just had to have a go at making a version of her card. 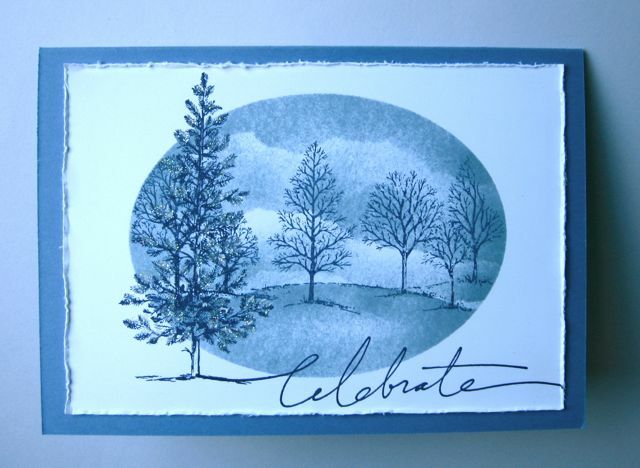 The stamp set used is Lovely As A Tree from the Stampin Up 2008 -09 Ideas Book and Catalogue. This is such a versatile set and can be used all through the year - see what lovely Christmas cards you can make with very little effort. I decided to use an oval for the mask and tried a number of different colours. I also randomly tore a piece of scrap paper to imitate what could be either clouds, hills or mist, so that I could do some masked layers in the background of the picture. To create the mask use a piece of thin paper (like photocopy paper) as you don't want any big ridges around the edges. The first card I made uses Always Artichoke Ink from the Stampin Up Rich Regals colour family and Mellow Moss from the Soft Subtles colour family. I've added some texture to the card by inking up the Sanded Background Stamp with Always Artichoke, and sponged around the edges with Mellow Moss. The images are stamped onto Naturals Ivory card stock and then mounted onto Brushed Gold card. 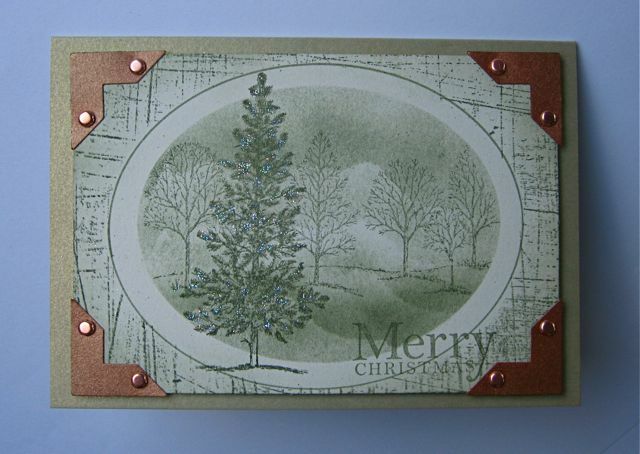 The photo corners are made with Stampin Up's Photo Corners Punch and Brushed Copper card. I added a little Dazzling Diamonds Glitter on the main tree to imitate snow on the branches. I like a bit of glitz here and there! The next colour range I used was Brocade Blue and Night of Navy. I love using blues for Christmas and using these two colours in this card enabled me to create a little more depth and definition with the images. A much simpler sketch for this card but I like the way it turned out. The third card uses Elegant Eggplant ink and a touch of Orchid Opulence to bring in some highlights. I used the ever useful White Gel Pen to create highlights on the large tree as it was getting a bit lost in the background where it overlaps the sponged areas. Now all I have to do is try these in lots of other colours and with some different shaped masks. They are so much fun and quite quick to make. If you would like more detailed instructions on any of the techniques used, you can contact me for help. You can also use the above contact if you would like to order any of the products used in these cards. The products will be posted directly to you, and you can pay via EFT, PayPal or credit card. You might like to browse the Stampin Up Catalogue online. It is full of wonderful products and has loads of ideas to inspire you to be creative with your paper crafting. If you are looking for some Stamp Set Bargains, have a look at my Retired Stamp sale slideshow. Learn how to save 20% on all your Stampin' Up Stamps and Accessories.